Looking for an easy and fun shark craft for kids this Summer? Introducing a shark sensory bottle that is unique and simple to make. The stunning sparkling colors are appealing and not scary like some of the sharks we see on television. 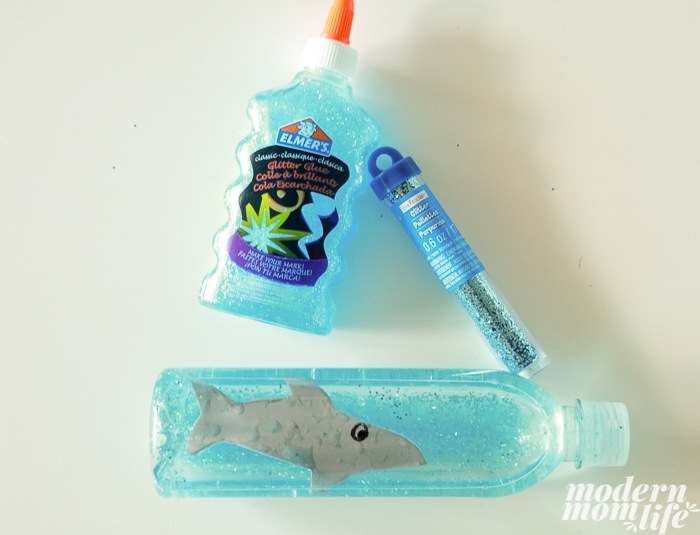 This sensory bottle is the perfect shark project for preschoolers. Print shark template on card stock paper. Trace stencil on gray foam paper. Cut with scissors and set shark aside. We decided to draw an eye using a permanent marker. Pour blue glitter glue in empty water bottle. We used half of the glue bottle. When we filled the bottle with the entire glue bottle it made it very dark and hard to see the shark. Remember, the less blue glue you put inside equals lighter water making it easier to see the shark. Fill the bottle with water and leave some room for the shark to fit later. Pour blue glitter to your preference. Fold or roll the shark to be able to fit into the bottle. Push through the bottle. Close with bottle lid and shake the bottle to mix. Consider hot gluing the water bottle top to ensure it doesn’t come off. Nothing could be worse than having exploding blue glue glitter on your nice carpet. What other shark craft ideas are you excited to try out? May your Summer only have shark fun and not real life encounters! Let me know how your littles like the shark sensory bottle!